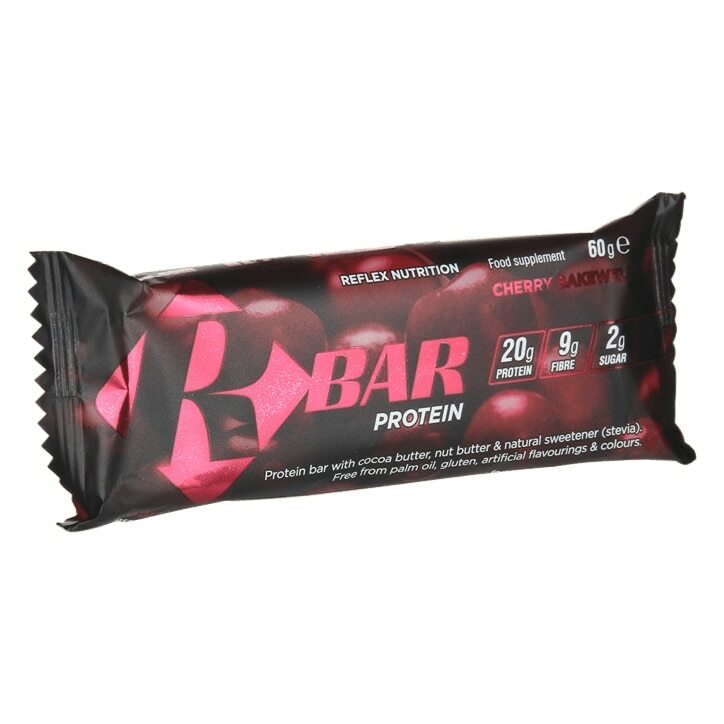 Reflex R-Bar Protein Cherry Bakewell is rated 3.4 out of 5 by 5. Rated 5 out of 5 by Finn64 from Great taste No sugar only stevia high protein and great taste plus very filling. Rated 1 out of 5 by Claremc from Had to chuck it away Oh my goodness, this protein bar is truly disgusting. No flavour, and bitter eww. Go for Phd or grenade instead! Upset that I've bought a second in this flavour as it was 3 for 2 in store. Never again! Rated 5 out of 5 by sid1 from naturally sweetened soft protein bar I really like this bar, it's softer than other protein bars which tend to be quite hard. It's also got a lovely flavour and sweetened with stevia rather than artificial sucralose. Rated 1 out of 5 by xxxx1 from Tasteless I generally like protein bars as I don't eat chocolate bars. This must be the worst bar I have ever tried. Its pretty much taste less, only thing you can taste is stevia which leaves horrible after taste in your mouth. Very expensive for what it is.